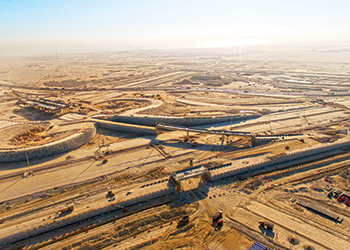 L&T is working on the Al Wakrah bypass in Doha. With $7.7 billion worth of projects in the GCC, India’s L&T is showing its prowess for executing major projects. With a healthy current order book of around $7.7 billion in the GCC and promises of more key projects from Kuwait and Africa in the near future, Larsen & Toubro (L&T) of India enjoys an enviable position in the construction market. The giant conglomerate has established its leadership in the Middle East in the realms of engineering, design and construction of major infrastructure, oil and gas, buildings, factories and industrial projects including power transmission and distribution projects. It has proven its prowess in project management with a capability to deliver concept-to-commissioning that is reflected in a number of landmark structures constructed across the Middle East. The $16.5-billion technology, engineering, construction, and manufacturing and financial services conglomerate established its presence in the Middle East over four decades ago with its first project to build the Abu Dhabi International Airport in the late 1980s. It is headquartered in Mumbai and operates in more than 30 countries worldwide. L&T is one of the major forces to reckon with in the power transmission and distribution sector, according to a company spokesman. “L&T Construction, the construction arm of L&T, was one of the earliest Indian organisations to commence operations in the Gulf and has, over the years, gained significant market presence in the UAE, Oman, Qatar, Saudi Arabia and Kuwait for executing power evacuation, transmission and distribution projects on an EPC (engineering, procurement, and construction) basis,” he says. Today, L&T is all set to provide single-window solutions to meet the complex power infrastructure requirements in the Middle East and offers integrated solutions and end-to-end services from design, manufacture, supply and construction to commissioning of EHV (extra high voltage) power transmission line projects. L&T is also present in the region in the field of electrical automation systems. 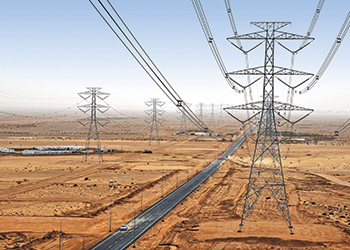 A 380 kV transmission line project in Riyadh ... by L&T. From an infrastructure business standpoint, L&T executes jobs on an EPC basis, lump sum as well as on re-measurable basis in the fields of roads, airport infrastructure, metros, railways, elevated corridors as well as roads and infrastructure development of townships. As an industry leader in augmenting capabilities for urban mass rail transit systems, L&T is currently executing metro projects in Riyadh (Saudi Arabia) and Doha (Qatar). In the hydrocarbon sector, L&T provides turnkey solutions to the onshore and offshore sectors encompassing oil and gas exploration, production, processing and transportation. The company possesses in-house capabilities in engineering, project management, procurement, fabrication, installation, hook-up and commissioning, and a dedicated team of professionals. L&T Hydrocarbon Engineering, a wholly-owned subsidiary of L&T, offers engineering, procurement, and construction/installation and commissioning (EPCIC) of large integrated process platforms, fast-track multiple wellhead platforms projects, living quarters’ modules, compression modules and integrated topsides for floating production storage and offloading (FPSO), oil/gas field developments, gas processing, refineries and petrochemical projects. In this sector, the company has executed projects worth more than $4 billion. L&T also offers single-point expertise for executing largescale brownfield works with minimum downtime. Some of its current projects in the power transmission and distribution segment include Kahramaa Power System Expansion Projects, Phases 11, 12 and 13 for Lusail Substation, Qatar; 132-kV overhead lines and substations for Saudi Arabia’s national grid; a 400-kV Ibri-Izki overhead line and 400-kV cable Sohar Independent Power Plant 3 in Sohar Free Zone in Oman; and 132-kV substations for Dubai Electricity and Water Authority (Dewa) in the UAE. In transportation infrastructure, L&T is working on the Al Wakrah bypass in Doha, Qatar; the Batinah Expressway in Muscat, Oman; and the Midfield Terminal Complex (Adac) and Mafraq-Ghweifat road project in Abu Dhabi, UAE. In the buildings and factories segment, L&T is involved in the construction of Al Rayyan Stadium, Qatar; a car-park for Abu Dhabi Terminal Building, UAE; Riyadh metro stations; and hotels for Omran in Muscat, Duqm Airport, and Adam Air Base in Oman. Meanwhile, in the water and effluent treatment segment, it is working on the Doha South Sewage Treatment Plant Phase Two expansion, and design-build and operate-maintain works of Al Shamal sewerage treatment works in Doha, which has a capacity of 7.5 million litres per day. L&T has several hydrocarbon engineering projects across the region. These include Saih Nihaydah Depletion Compression Phase Two and PDO Kauther Depletion Compression Phase Two for Petroleum Development Oman (PDO) in Oman; Kuwait Oil Company’s crude gathering centre GC-30 in Kuwait; Hasbah Phase Two, Safaniya (SFNY) four wellhead decks, 17 tower cranes and Midyan gas processing facilities for Saudi Aramco in Saudi Arabia; and a project for Abu Dhabi Oil Refining Company (Takreer) at Abu Dhabi International Airport. Notable infrastructure projects by L&T in the GCC include the middle bridges on the trunk of The Palm Jumeirah, Dubai, and Khalifa Port Interchange, Abu Dhabi, in the UAE; and dualisaton of the Ghala-Al Ansab Road, design and construction of improvements at Al Athaibah flyover and junction, Mahalah Ghubbrat Al Tam Ismaiyah Road, and design and construction of underpasses and flyovers along Darsit Al Wadi Al Kabir Road in Oman.